I love the SUYL link ups that sweet Kelly from Kelly's Korner hosts and jump at the chance to join the party whenever I can. This week is right up my alley as it's all about recipes and what's more- healthy recipes! Can't wait to see what the others have posted. ** Sidenote, (April 11th) also posting this for the pasta SUYL as it's also my favourite pasta recipe. Now that summer is upon us, it's the time of the year I whip out my sesame chicken cilantro pasta. I started to make this the summer after we first got married. It was a lazy Sunday and I had chicken in the fridge, cilantro and green onions. I googled those three ingredients thinking some sort of chicken salad would pop up but instead this pasta did. Cue the heavenly music- I knew I had a winner! I was so excited to make this that I ended up going to the grocery to pick up a few ingredients anyways. Now I make it all the time. D and I can have this weekly. The kids have begun to love it as well. Guests we have also love it and it's a quick and easy meal to put together when there's so much stuff to do in the summer! Put cooked pasta into a large bowl. Here are some other alterations I use as well. 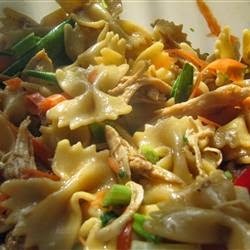 - I usually add about a cup of chopped sweet peppers as well. You can also add chopped celery, carrots, cherry tomatoes, mushrooms etc based on your preference. Maybe I'll do that this year! - I haven't tried it but I think steamed shrimp would work really well also. This meal tastes even better the day after and it can be served either hot or cold. Enjoy!! !